Tuesdays, starting Oct. 16, from 3-4:30 p.m. Eastern. Deb Dib will lead the 10-week training program to become certified as an expert in branded career communications as a "Get Clear, Get Found, Get Hired!" coach, a joint effort of The Academies and Reach Personal Branding. Learn the principles to teach your clients to build an "organic web of influence across multiple channels." Shift from traditional career writing to the new trend of short-form branded writing demanded by today’s social media communications and distracted, multitasking decision-makers. Learn the writing secrets of Deb Dib, one of the most successful (and most highly compensated) writers in the industry today! Add a new revenue stream! Go beyond resumes to provide the comprehensive oral and written CareerComm needed for job search and career management 2.0+. Understand how personal brands, career brands, value propositions, and tag lines translate to turbocharge job seeker success. Create compelling, branded value propositions and learn to infuse them across on- and off-line CareerComm, from Twitter bios to social media profiles to Twit-Fit Resumes™, 10-Tweet Cover Letters™, video scripting, 15- and 30-second pitches, and more! When you register for the launch program, you’ll be among the first in the world to earn the Certified Get Clear, Get Found, Get Hired! Coach certification. The group meets via conference call for 90 minutes each week for 10 weeks. When you complete the program, you'll receive two certifications: The "Get Clear, Get Found, Get Hired!" 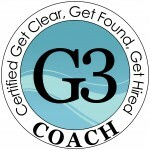 coach certification plus the 360Reach Certification offered through Reach Personal Branding. The cost for the training is $2,497 (or four payments of $647).